Maybe you’ve heard the story of the first Star Wars Christmas, and maybe you haven’t. Maybe you know about the mail-in certificates, and maybe you don’t. Either way, the story is worth telling and retelling because for all that the future holds for the Disney era of George Lucas’s creations, the first Star Wars Christmas is the only Star Wars Christmas that will ever be defined by one “brilliant” idea — and zero action figures. Our story begins in the 1940s — or at least it does when Corky Steiner tells it. Steiner is a former executive of the company once known as Kenner Products, and the son of Phil Steiner, who cofounded Kenner with brothers Al and Joe. One day, Corky Steiner says, Al Steiner notices a kid blowing bubbles. Al Steiner figures there’s a toy to be had in that act of play, and he’s right. The Bubble-Matic Gun is born, and Kenner, a “very small company” that manufactured pine-tar soap, among other things, is reborn. While Kenner gets to work, Star Wars becomes a phenomenon. Released in May 1977, it rolls from summer through Thanksgiving as Hollywood’s unrivaled, No. 1 box-office hit. By holiday shopping season, Star Wars merchandise, including mass- and locally produced knockoffs, is flying off shelves. There is, however, a hitch, for customers and for Santa alike. The essence or star of the Star Wars line is the 3.75-inch action figure cast in the detailed likenesses of the film’s characters — and, as Steiner says, it’s not ready to ship. So, Kenner’s Loomis goes for it again. 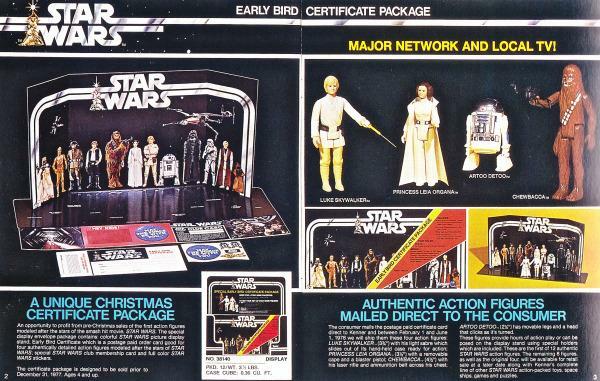 Sold for about $10 each, the Early Bird Certificate Package is a little, rectangular box adorned with Star Wars illustrations. Inside is a form. Fill it out, mail it in — and then wait up to six months for Luke, Leia, R2-D2, and Chewbacca action figures to be sent to you. In the age of same-day delivery, this deal sounds insane. In an analog galaxy far, far, away, the IOUs are a hit — “expected to be a complete sellout for Christmas '77,” hometown newspapers report. In California, 8-year-old Mike Sterling is among those sold. 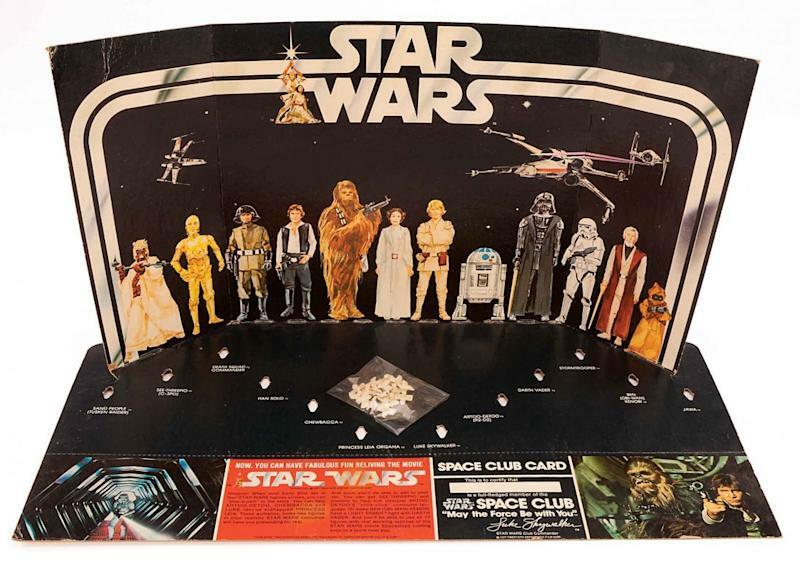 “I was so in the bag for Star Wars… even just the promise of the eventual arrival of Star Wars action figures was enough to keep me happy,” says Sterling, currently the owner of the Camarillo, Calif., comic-and-toy shop Sterling Silver Comics. In New Jersey, 12-year-old Gus Lopez is so anxious to get the Early Bird Certificate Package that he buys it for himself before Christmas — with money saved from a 20th-century profession known as a newspaper route. 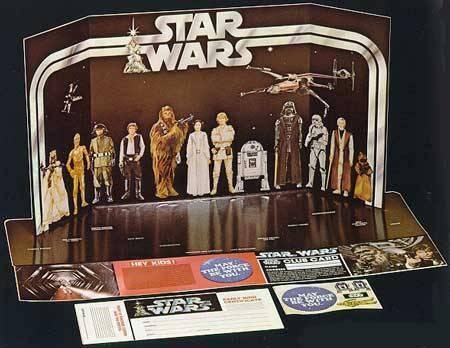 “You have to keep in mind that in 1977 there was so little Star Wars product, so anything that came out was welcomed, especially around the action-figure line,” says Lopez, now the creator of The Star Wars Collectors Archive. And the wait for those action figures? And Christmas morning isn’t so bad, either. “The kit did come with the backdrop and a handful of stickers and so I wasn’t completely empty-handed,” Sterling says. And that’s another reason the story of the first Star Wars Christmas is worth telling and retelling: It worked out. Loomis, who died in 2006, lived to see the Early Bird Certificate Package become a collector’s item, the subject of a 2005 limited-edition reissue, and a defining mark in a distinguished career. More than that, the first Star Wars Christmas commercially changed every Christmas that followed. Never has that phenomenon been more evident than now. Even before the new Star Wars movie, The Force Awakens, arrives in theaters on Dec. 18, the latest lines of Star Wars toys have grossed an estimated $2 billion since being launched on so-called “Force Friday” in September. But even with demand creating “some shortage of products,” as Brian Goldner, the CEO of Hasbro, the toy giant which bought and ultimately absorbed Kenner, put it last month to Fortune, no child of 2015 need worry about receiving an IOU on Christmas Day. Hasbro righted production; all is right in the toy store. And in any case, the first Star Wars Christmas only happens once.